Scientific theories tend to come and go over the years. In fact, there is a rather pessimistic slogan among philosophers of science that says, “All theories are born refuted,” meaning that sooner or later they are all replaced. It may therefore come as something of a surprise that the periodic table of the elements, which is 150 years old in 2019, should have survived for so long. Admittedly it may not technically be a theory as such, but the periodic table has nevertheless served as a scientific organizing principle of enormous power and influence since it was first published. The table was laid out in 1869 by the Russian chemist Dmitri Mendeleev who realized that the properties of the elements seem to recur approximately after every eight elements if they are placed in order of their increasing atomic weights. Lithium, for example is a soft, reactive metal. So is sodium, which comes eight spots later on the list. And so is potassium, another eight spots later. As with nearly all scientific discoveries, other scientists had come close to making the same discovery but for one reason or another they did not receive much credit. The very first hint of chemical periodicity was announced by a French engineer, Alexandre-Émile de Chancourtois, who also designed a three-dimensional periodic system that he named the telluric screw. Then came two London based chemists, John Newlands and William Odling, who arrived at their own rudimentary periodic tables while working completely independently. 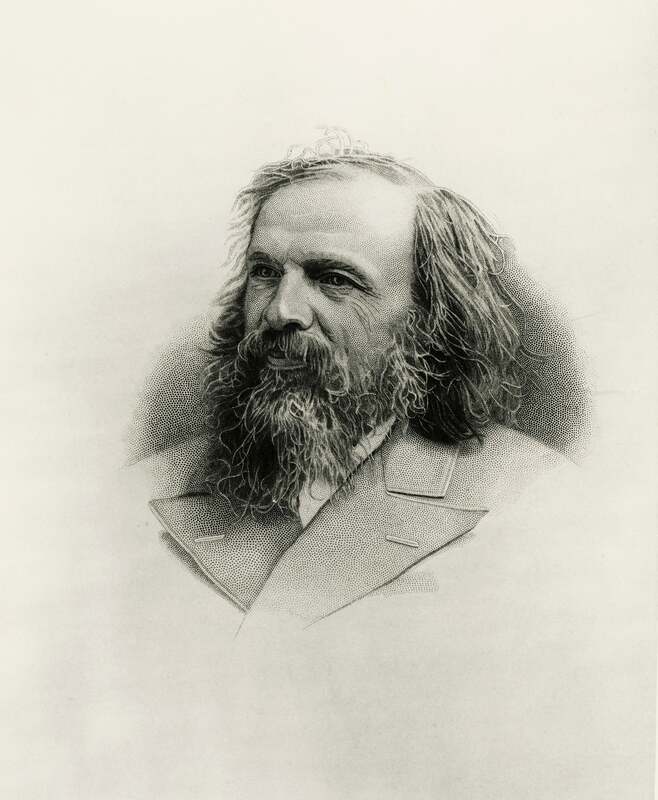 In the United States a Danish émigré, Gustav Hinrichs, also realized that the elements could all be placed within one coherent system, as did the German chemist Julius Lothar Meyer. But none of these scientists was able to make predictions about new elements that might be discovered, as Mendeleev did, or to champion the value of the periodic table to the same extent as he succeeded in doing. During the 20th century, the science of physics, which essentially explains all of chemistry, experienced a major revolution. Scientists including Niels Bohr, Wolfgang Pauli, Erwin Schrödinger and Werner Heisenberg discovered that at the scale of the atom and its constituent particles, the laws of ordinary of classical mechanics needed to be replaced by new laws of quantum mechanics. Yet even though this revolutionary theory became the basis for explaining the behavior of atoms which make up the various elements, the periodic table remained essentially unchallenged. Of course, there have been some changes in the table, although they have been relatively minor and, in some cases, almost cosmetic. For example, the elements are no longer ordered according to atomic weight—the total of protons and neutrons in their atoms’ nuclei—but instead according to increasing values of atomic number, which is the total of protons only. Secondly, the original eight-column tables have largely given way to wider 18-column tables that capture the relationship between the elements in a more accurate manner. One of the many virtues of the periodic table is that it brings about a simplification and coherence to the world of chemistry and, more specifically, to the elements. Instead of having to learn the properties of 118 currently known elements, the student of chemistry, or the professional chemist, can get by with a knowledge of the typical properties of about just 10 of them. The chemist needs to know the properties that are typical of the elements in groups 1 and 2 as well as those in groups 13 to 18 inclusive. In addition, he/she must become familiar with the typical properties of the elements that fall in the central or d-block of the periodic table. These elements consist mainly of dense metals that are capable of forming different numbers of bonds depending on the particular compounds that they find themselves in. The last of the 10 typical elements lies in the odd-looking block that form a footnote to the main body of the periodic table. These f-block elements include the commercially very important rare earth elements and typically form three bonds with other elements. One of the first triumphs of the periodic table took place soon after it was first discovered. In addition to incorporating all the elements that were known at the time, Mendeleev left several empty spaces in his table, predicting that new elements would be discovered to fill them, and laying what their properties would be. Specifically, he predicted the existence of four elements. Remarkably enough, three of these elements, subsequently named gallium, germanium and scandium, were discovered within 15 years of Mendeleev’s predictions. The fourth, now known as technetium, was first synthesized in 1937. These predictions served to establish the periodic table as an extremely useful tool in addition to being one that could explain the properties of the already known elements. The predictive power remains to this day and helps to explain the continuing relevance of the periodic table. For example, in the 1990s it was discovered that the compound YBa2Cu3O7 could behave as a high temperature superconductor. In order to search for other such materials scientists needed just to consult the periodic table in order to predict that compounds in which yttrium was replaced by lanthanum would also be high-temperature superconductors. This is because lanthanum lies one place below yttrium in the periodic table. It was soon discovered that analogous lanthanum-containing compounds were indeed superconductors and in fact more so than those containing yttrium. Chemists are also using the periodic table to predict the existence of still undiscovered elements. For example, while the elements at the very high end of the periodic table are highly unstable, researchers have long suspected there might be a so-called “island of stability” with atoms of a still higher number. These predictions had centered on element 114, now known as flerovium, created in a Russian reactor in 1999—although its enhanced stability has turned out to be less than first anticipated. But the search still goes on. The year 2019 has been designated as the Year of the Periodic Table by UNESCO. The continuing value of this marvelous scientific icon is a good reason for all of us to raise a glass of vodka in honor of the man who is rightly considered its discoverer: Dmitri Mendeleev. Eric Scerri, PhD, is an author as well as a historian and philosopher of chemistry who teaches in the Department of Chemistry and Biochemistry at UCLA. He has previously published two feature articles on the periodic table in Scientific American, which you can read here and here.